It was a Downtown Central "who's- who" as Commander Andrew Smith, Captain Jodi Wakefield, and Captain Michelle Veenstra were re-introduced by Tom Gilmore, Chief William Bratton and 14th District Councilmember José Huizar at last evenings promotion party sponsored by the Downtown B.I.D.s. 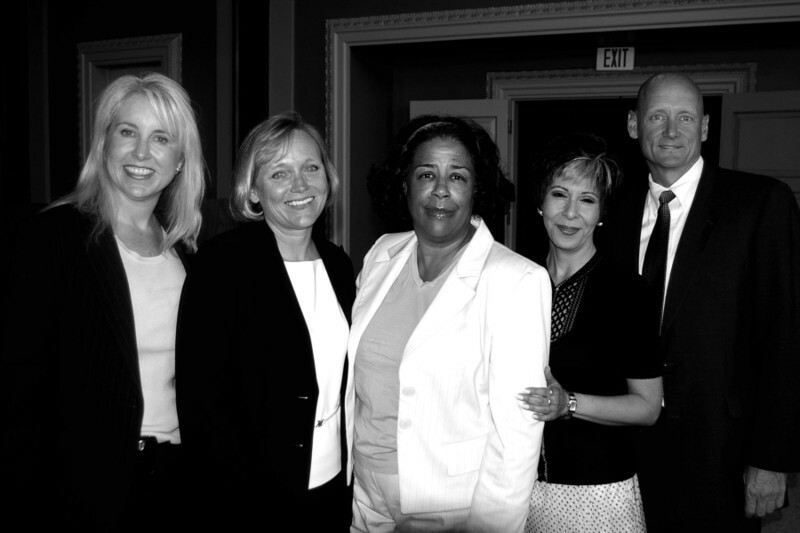 9th District Councilmember Jan Perry was at the event earlier in the evening before being whisked away to attend High School graduation ceremonies, and later Huell Howser and 4th District Councilmember Tom Labonge offered congratulations to Smith, Wakefield and Veenstra. Chief William Bratton and wife Rikki Kleiman. Huell Howser prepping to take a photo with Sgt Kris Werner and family. 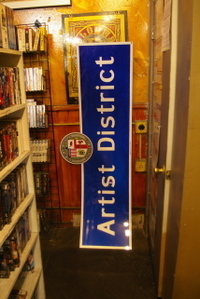 The city came by this morning around 10am to install a new sign. 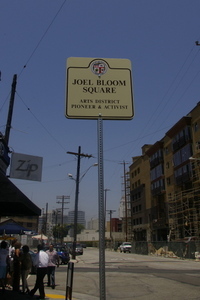 It reads "Joel Bloom Square: Arts District Pioneer and Activist." You can see it at East3rd and Traction, next to Zip. 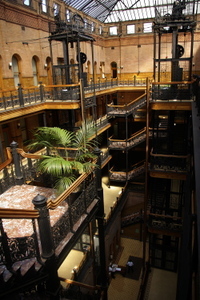 Add June 29. 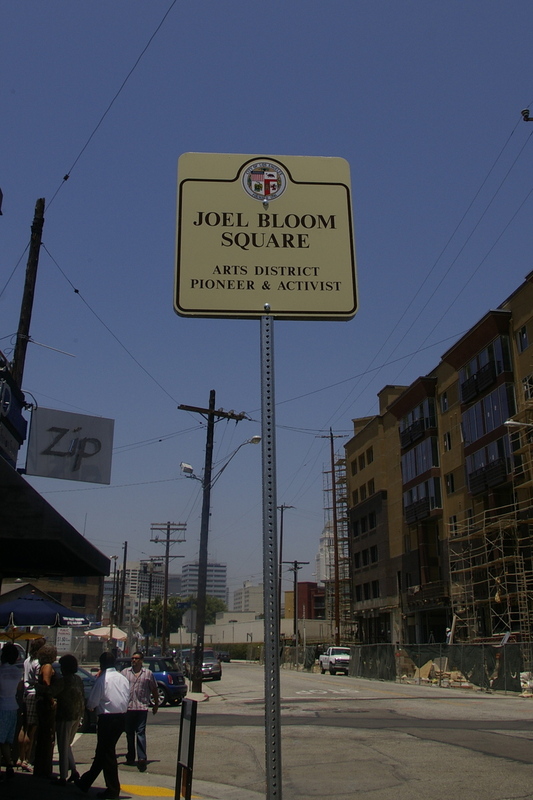 I posted more at blogdowntown (Joel Bloom Square Proposed) and his family have been dropping in "thank you's" to the community at large. View From a Loft noticed the morning it was missing, and since then it's been reported that the sign was taken down by a film crew to keep an LA marker out of a background shot and simply "not returned." 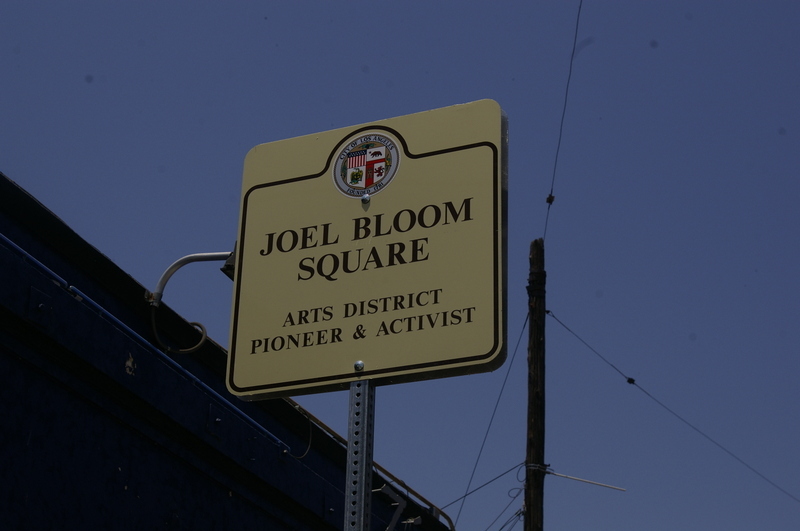 With the ongoing appreciation of Joel Bloom, a replacement was made (at a slightly larger size). 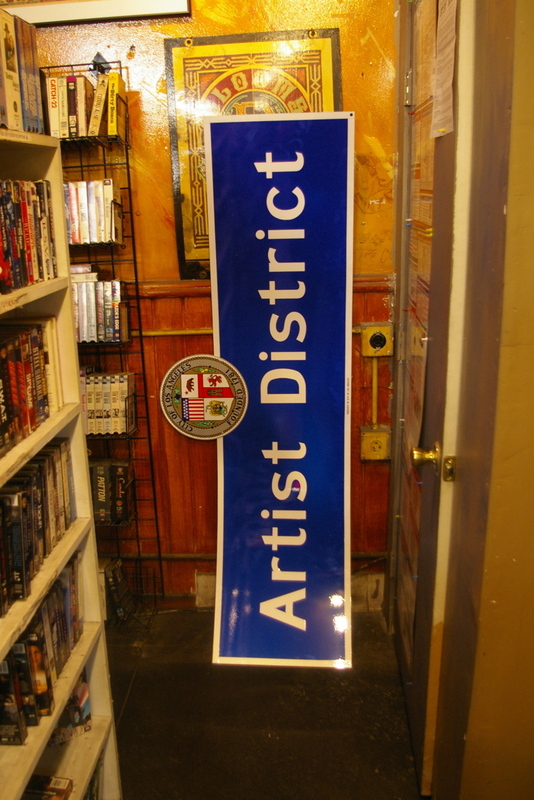 LARABA Board member, FilmLA/Arts District liason, and CitizenLA Managing Editor Jonathan Jerald did the leg work, including explaining to the city sign maker that yes...this one time it's 'Artist District'. He hoped to make a formal presentation to Joel and hopefully that will be made soon. Add: Undisclosed staff source from City Hall notes that this blog, and LA City Nerd's call to action to document signs, had this missing sign on the radar. 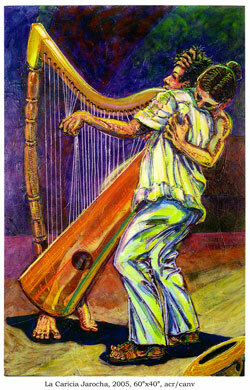 This exhibition will include nearly sixty artworks spanning Healy’s four decades as a practicing artist. An active participant and recorder of life in the City of Angels, Healy’s vivid paintings, prints and etchings combine cultural and political specificity with themes of universal and global relevance. 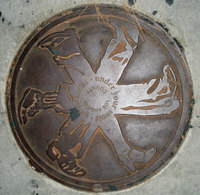 Hey Mack, those decorative manhole covers you found near the Mayan Theatre are also by Grand Central Market. 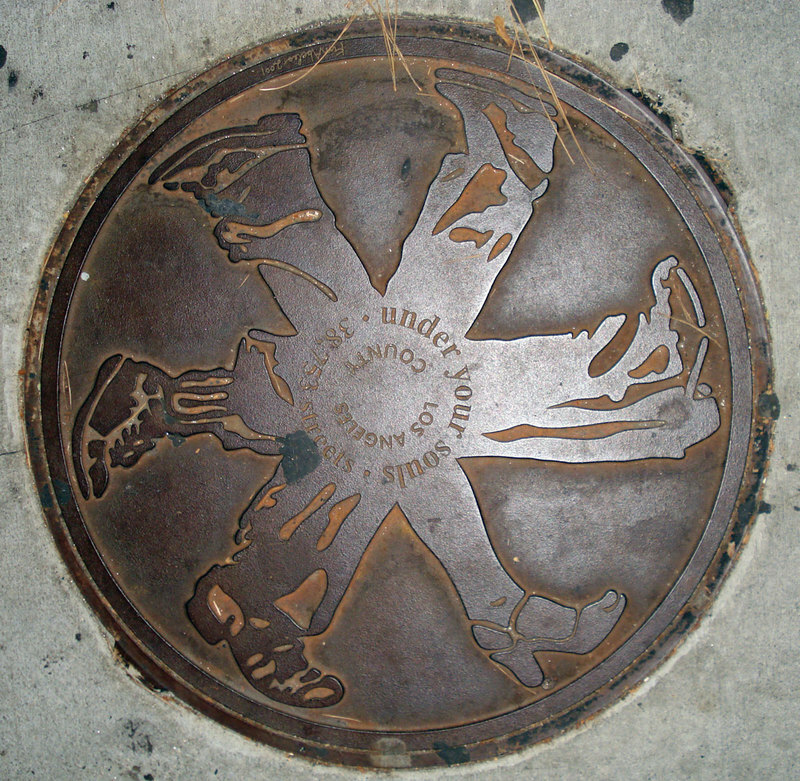 They are from the Hill Street Avenidia (2001) public art project by installation artist Kim Abeles - to tell the story of those who worked underground in the 20s and 30s to build storm drain channels and install early communication lines. None wore masks. Abeles is a installation artist whose works are urban experiences "chronicling historical and contemporary issues housed in sculpture and installation" and considers herself part artist, activist and sleut. 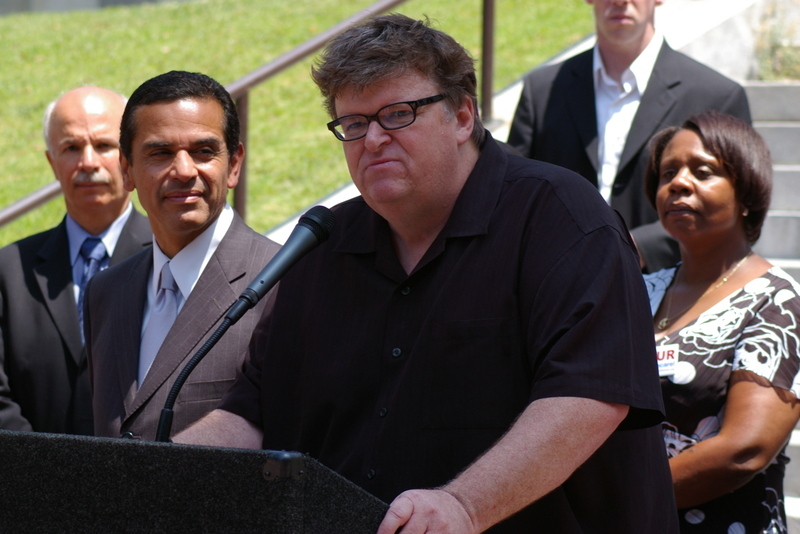 After speaking this morning on behalf of Health Care reform with the Mayor Villaraigosa and people who are subjects of his healthcare documentary "SiCKO", filmmaker Michael Moore stayed on the City Hall south lawn to speak to reporters. 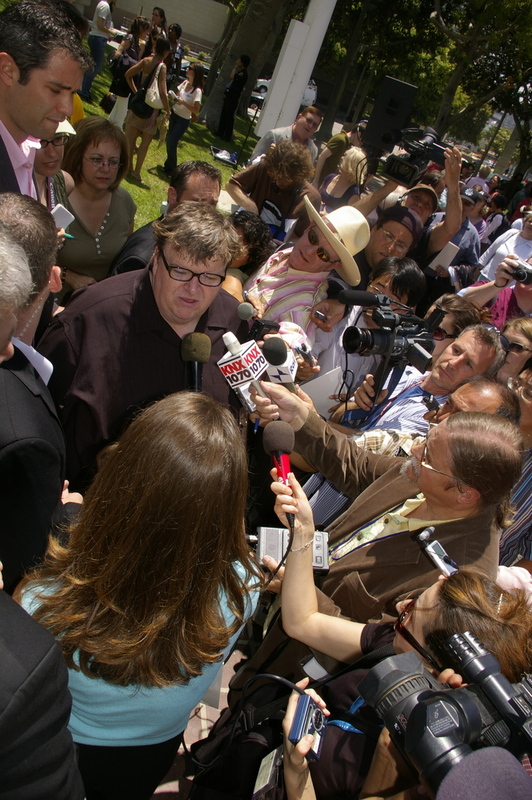 "SiCKO" was first screened at Cannes May 19, and the Arclight had a sneak preview last Saturday evening, but Moore considers last night's screening on Skid Row in front of the Union Mission the real "premiere". There were more than 50 cases of patients being dumped in Skid Row that prompted a lawsuit to be filed by the City Attorney's office.. Kaiser Permanente accepted a patient-dumping settlement last May. 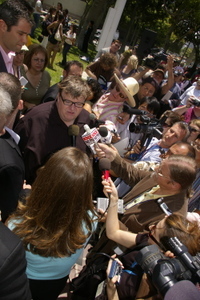 Moore is taping a Tonight Show appearance this afternoon before attending a Beverly Hills premiere. The film in general release this Friday. 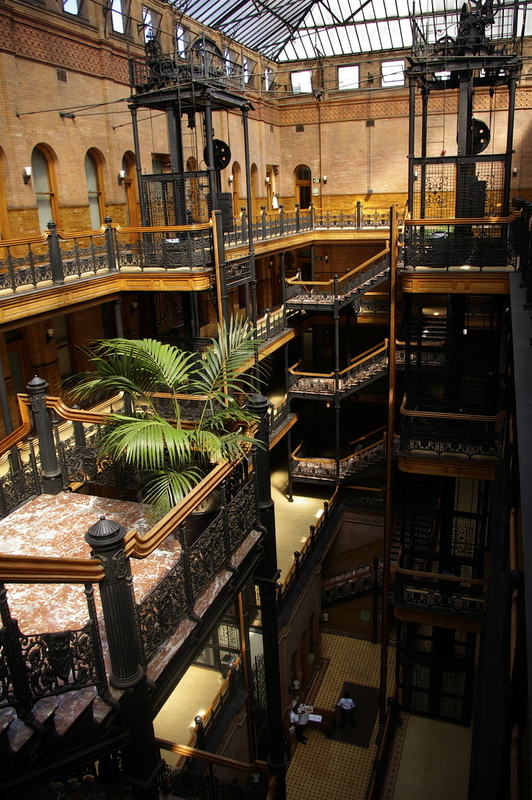 The hometown had a lot of ink spilling from the IE LATImes lately. Bomb threats cause havoc for graduation, Sci-Fi is stored at UCR, and Riverside is outed as the first home of the future home run king. The stories are after the jump.